Spruce’s formal name is: Salty Dog Sieur de Monts. Sieur de Monts was the Lieutenant Governor of New France, named in 1603 by the King of France. The territory under his control extended from Philadelphia to Montreal, and it included Maine and Nova Scotia. His family name is Spruce, because he chews on spruce bark and cones. Spruce was born on April 25, 2018 in Ardoise, Nova Scotia at Salty Dog Kennels. He is a Nova Scotia Duck Tolling Retriever. His parents are Sadie and Rooster. 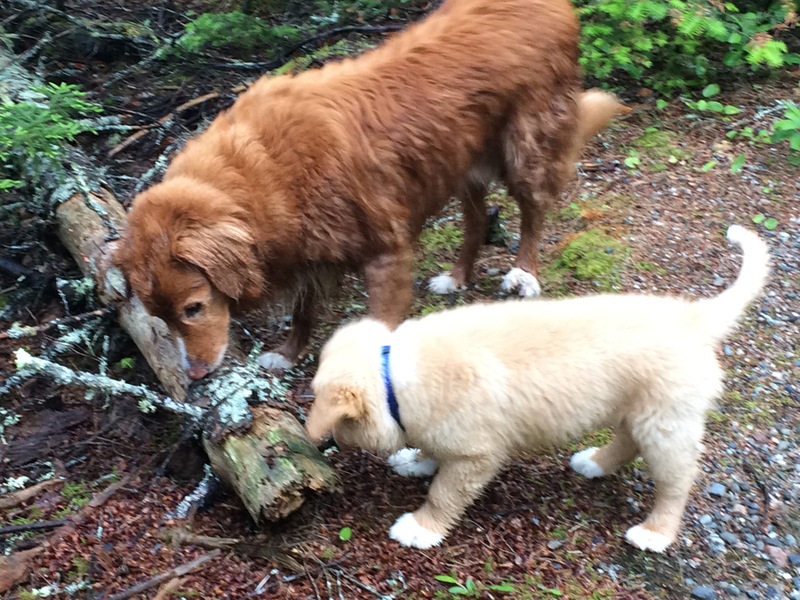 Tait (short for Taittinger) is also a Nova Scotia Duck Tolling Retriever. He is Spruce’s great uncle, and their bloodlines go back to Harbor Lights Kennel. As Spruce is learning the ropes here at Rabbit Hill, we’ll share more of his life with you. Happy hunting Tait and Spruce! « Thanks for joining us for Open Farm Day, 2018!